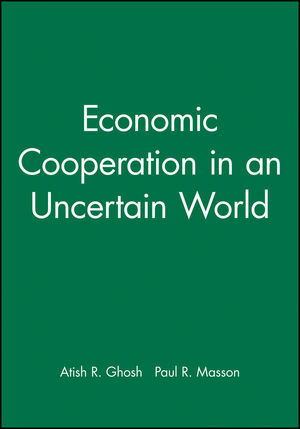 Economic Cooperation in an Uncertain World examines the case of international policy coordination in the face of macroeconomic uncertainties. It begins by developing a theoretical framework for analyzing the benefits of coordination when there is uncertainty about the effects of macroeconomic policies. As an illustration, this framework is applied to analyze the efforts of the central banks of the major industrialized countries to deal with the global stock market crash of October 1987. Atish R. Ghosh is Assistant Professor of Economics and International Affaires at the Woodrow Wilson School of Public and International Affairs and the Department of Economics, Princeton University. He has written extensively on iseeues in internatioanl macroeconomics, including the effects of fiscal policies in the global economy, the nature of international capital flows, exchange rate determination, and monetary and fiscal policy coordination. Paul R. Masson is Assistant Director of the European I Department of the International Monetary Fund. Before joining the Fund he worked at the Bank of Canada and the OECD. His publications include books and articles in various fields of macroeconomics and international economies, including policy coordination, currency unions and monetary and exchange rate models. 2. A Theoretical Framework for Modelling the Open Economy. 3. The Theory of Policy Coordination Under Uncertainty. 4. An Example: The Stock market Crash of October 1987. 5. Alternative Empirical Models of the Open Economy. 6. Model Uncertainty and the Gains from Coordination: An Empirical Analysis. 8. On the Sustainability of Cooperative Agreements. Appendix - Cooperation and Coordination in Historical Perspective.